What does it mean to document a revolution? 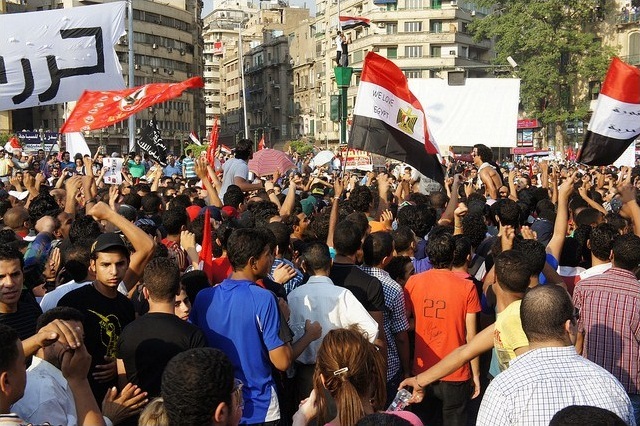 The recent massive uprisings in Arab countries created a plethora of artifacts: printed documents of various kinds used by protesters to organize their efforts and codify their ideals, demands, and goals; photographs and video recordings of protesters in the street, news broadcasts, televised speeches by beleaguered leaders; posters and signs used to motivate the efforts of both revolutionaries and counter-revolutionaries; creative responses in the form of art, music, multimedia performances; and websites and social media tools for organizing, motivation, and documentation. Documentation of the so-called “Arab Spring” involves collecting a number of formats, some born-digital, some analog, and all almost entirely ephemeral, fleeting, and endangered. 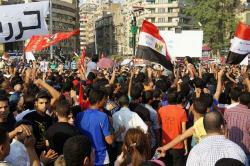 This photograph of a Tahrir protest was taken on September 9, 2011, and posted in Kodak Agfa’s photostream on Flickr. This volunteer group consists of historians, political scientists, anthropologists, and technology experts “collecting everything we know, including oral testimonies, blogs, newspaper clippings, even Facebook status messages and tweets in order to make this a wide library resource for anyone studying the events.”1 The group organized on January 14, 2011, the date of Tunisian president Ben Ali’s resignation. R-Shief—R-Shief is a data-mining project that draws content from Twitter and various websites and blog posts. It attempts not only to document the Arab Spring, but also provides tools for visual analysis of this data. Its “Twitterminer” tool (one of the very few places that provided public access to tweets posted during the Arab Spring), permits data analysis using preselected hashtags. Media artist and critic Laila ShereenSakr (who also publishes under the name “VJ Um Amel) founded this project in 2008. “Arab Spring: An Interactive Timeline of Middle East Protests”— Developed by the UK’s Guardian newspaper, this beautifully designed tool provides elegant access to the web-based archive of Guardian news stories on the “Arab Spring.” The timeline begins on December 19, 2010, with the news of the December 17 self-immolation of Tunisian Mohammed Bouazizi, and has been continuously updated (last viewed September 7, 2011). “Collection: North Africa and the Middle East 2011”—The Library of Congress has established several projects to archive the web in partnership with the Internet Archive, using IA’s subscription service Archive-It in collaboration with other research and memory institutions around the world. AUC’s “University on the Square”—With financial support from the Andrew W. Mellon Foundation, this project was initiated in the spring of 2011 at the American University in Cairo (AUC) to take advantage of the university’s unique position, with its downtown campus located right on Tahrir Square. In addition to collection posters and artwork, the project included gathering oral history from students and others affiliated with the university about their experiences during the spring uprisings. The website created as part of this project includes an image gallery and links to video files contributed by AUC students and faculty. Tahrir Documents—This initiative focuses on documenting the printed ephemera of the spring 2011 uprisings in Egypt. The website provides scans of dozens of printed leaflets, from religious tracts to lists of political demands and handbooks for protesters. It is particularly useful for providing not only scans of the original documents, but also translations into English, done by a team of volunteers. The website first began posting in March 2011. 25Leaks.com—The individual initiative 25Leaks.com, which also began in March 2011, is an ambitious attempt to document and provide access to materials seized by protesters from the infamous state security headquarters after Mubarak was ousted from office. The site is in Arabic only, and the site’s creators have remained anonymous for their own safety. Among several attempts to use Facebook as an archive is “Revolution Graffiti,” which created a Facebook page on March 4, 2011. The page description reports: “This page is mostly to gather all revolution graffiti images in one place. In other words archiving the graffiti. By revolution graffiti I mean graffiti created from the start of the revolution till now and later on.” The page offers a variety of artwork, projects, articles, and comments related to uprisings in regions like Cairo and Libya. Many photographers also uploaded revolution-related photographs to flickr. The biggest problem with this kind of resource is self-curation: specific people could be tagged but are not; precise metadata is often not available; and photos might be tagged or not at all. In previous collaborative projects, the Library of Congress and the American University used Archive-It to collect various kinds of web content, including Twitter feeds. However, it remains difficult to “excavate” relevant content from archived Twitter feeds using hashtags. The new publication Tweets from Tahrir: Egypt’s Revolution as it Unfolded, in the Words of the People Who Made It (OR Books), edited by Alex Nunns and Nadia Idle, paints “an exhilarating picture of an uprising in real-time,” containing Twitter updates by thousands of young people who documented on cell phones every stage of the revolution, as it happened. The New York Times called the book “a feat of nearly real-time publishing.” It demonstrates how technology has undoubtedly changed the way that wars, battles, uprisings, and revolutions will be documented from now on. 1. Mary Mourad, “We Will Document Egypt's Revolution, not Dictate the Story: AUC Professor,” Ahram Online May 28, 2011, accessed September 30, 2011, http://english.ahram.org.eg/News/13026.aspx. 2. Jack Schenker, “The Struggle to Document Egypt's Revolution,” The Guardian July 15, 2011, accessed September 30, 2011, http://www.guardian.co.uk/world/2011/jul/15/struggle-to-document-egypt-revolution.